Suzanne Carlisle Crowley, a published author, artist, and mother of three, was born November 19, 1963 in the small west Texas town of Uvalde to architect Acree Carlisle and the former Corinne Orr, teacher and homemaker. Suzanne has two sisters, Bonnie and Karen, and grew up in Austin, Texas, later moving to Houston where she graduated from Stratford High School. Following in her parent’s footsteps, Suzanne attended The University of Texas at Austin where she received a Bachelor of Journalism degree with a minor in English in 1986. 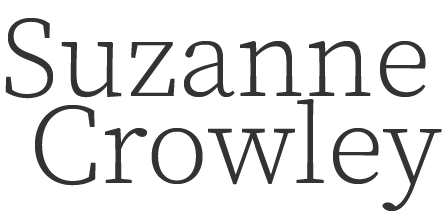 Suzanne’s literary career began at Austin Homes and Gardens magazine where she wrote copy, manned the phones, and learned the ropes. After marrying Daniel J. Crowley, she had two daughters and began a series of relocations that would take her from coast to coast and north to south. Her travels brought her from Austin to Washington DC, San Diego and San Jose, California, Orlando, Florida, and Southlake, Texas where she now resides. She and her husband welcomed a son Cameron in 2000. From an early age, Suzanne loved books and telling stories. Her earliest story, “The Secret Alley,” handwritten at age six on notebook paper remains in her possession. Later her writing evolved into more elaborate typed chapter books, stapled and glued to boards complete with illustrated covers. Some thirty of these, yellowed and frayed with age, are treasures that she shares with her children, nieces and nephews. “Marcella Monday,” the tales of an adventurous mouse, “The Return,” the story of nice witches who return when the moon is red, and “Patsy and Pensy” the journey of two pennies, are her mother’s favorites. Suzanne’s hobbies and interests are numerous and include oil painting, playing piano, reading, and art collecting. But her most enduring love is reserved for miniatures and doll houses. Suzanne was inspired by her grandmother Edith Carlisle who kept a blue willow ginger jar filled with tiny treasures for Suzanne when she came to visit. Suzanne was also enchanted by all the small, delicate items from around the world her other Grandmother, Corinne Orr kept on her beautiful vanity. While in high school, she discovered a nearby doll house shop and took a few classes, later making her own miniature room boxes in college. Her hobby bloomed into a home business, Crowley Interiors, where Suzanne produces finely sculpted miniatures and room boxes and sells them at shows across the United States. Her work has been featured on the covers of American and international miniature magazines and she is a contributing author as well. She is also the author of a miniature book on the history of paisley fabrics.  Suzanne’s writing career expanded to two unpublished historical romance novels. But she decided to write a different type of novel, something her children and grandchildren would enjoy following the 9-11 tragedy. In 2003, Suzanne penned, “The Very Ordered Existence of Merilee Marvelous” in three short months, followed by several years of revisions. It was published in 2007 by Greenwillow Books, an imprint of Harper Collins.